Nowell and Dickerson fouled out in OT as UW lost to Oregon State in the first round of the Pac-12 tourney, ending their long shot at the NCAA tourney. The surprising season of the Huskies’ men’s basketball team clanked to an unceremonious end Wednesday night in the Pac-12 tournament in Las Vegas when seventh-seeded Washington (20-12, 10-9) fell 69-66 to 10th-seeded Oregon State in overtime. UW’s sixth loss in the final nine games virtually assured denial of entry to the NCAA tourney on Selection Sunday. A berth in the second-tier, 32-team NIT is probably forthcoming, but it is a distinct comedown following Washington’s upset win over Arizona at Hec Ed Feb. 3. The Huskies lost three in a row after that and never regained the early season momentum under Mike Hopkins, who in his first season was the Pac-12’s coach of the year. It was the third close contest between the teams this season, Oregon State winning 97-94 in two overtimes in Corvallis Feb. 8 and Washington prevailing 79-77 in Seattle a week ago. Huskies point guard David Crisp nearly sent the tourney game into a second overtime when his 40-footer at the buzzer was straight on target, but clanged off the back of the rim. Both teams shot poorly from outside, the Huskies missing 15 of 21 threes and Oregon State 17 of 22. The Huskies failed to take advantage of an ankle injury to Oregon State’s top scorer, Tres Tinkle. He was three of 14 from the field, but hit two free throws with two seconds left in OT to extend the lead. In regulation, Matisse Thybulle, who led the Huskies with 16 points, hit a three with 57 seconds left for a 57-55 lead. But Drew Eubanks, who led OSU with 19 points, made two free throws to tie at 33 seconds. 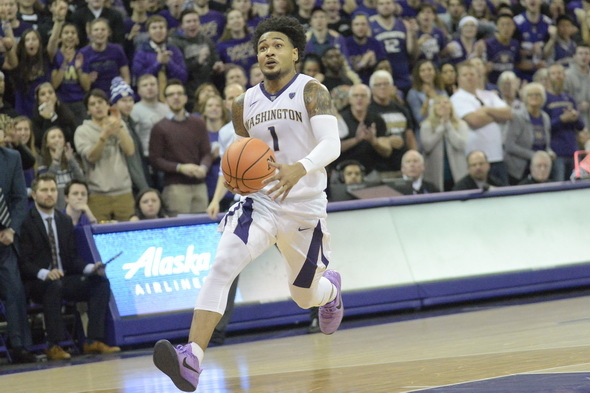 The Huskies’ leading scorer, freshman Jaylen Nowell, was called on for his usual forced final shot that had no chance, but the Beavers failed to convert, forcing the overtime. In extra time, Nowell fouled out and was followed shortly by Dickerson. Crisp committed the final critical error with 21 seconds left when he threw a pass behind him to Dominic Green that went high and out of bounds. Oregon State moves on to play Thursday No. 2 seed USC, which had a first-round bye. The Huskies return home and hope to host a first-round NIT game after getting shut out of the Big Dance for a seventh consecutive year. I love what Coach Hop has done this year, but repeatedly giving the ball to Nowell with the game on the line to let him freelance and throw up a low percentage shot is killing me. A pick and roll with Crisp or a post entry to Dickerson is a way better option. Also, one ref in particular last night seemed to have it in for the Dawgs. The last foul calls on Dickerson and Nowell were ultra-petty, and Crisp should have been given an and 1 on his layup late in the game.